Ray Jackson was a 3 year letterman for Ohio State at cornerback where he posted 103 tackles. 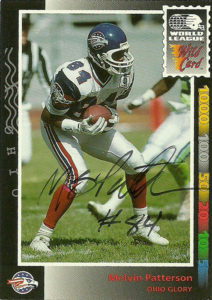 He was drafted by the Seattle Seahawks in the 7th round of the 1989 draft and then bounced around from there to the Atlanta Falcons, and then over to the Toronto Argonauts of the CFL. 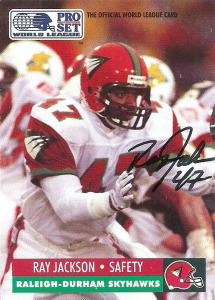 Afterwards he’d be selected by the Raleigh-Durham Skyhawks of the WLAF (4th round, 35th pick) and shifted to Safety in 1991. While the team posted a 0-10 record, it provided plenty of time for the defense to be on the field. Ray led the team in tackles with 68 (including 50 solo stops), 1 sack, 4 quarterback hurries, 2 forced fumbles and recoveries, an interception, and 3 pass break ups. After the season the Skyhawks would be euthanized, and the players dropped back into the talent pool of the league draft. In Raleigh-Durham’s place the league elected to create the Ohio Glory. The Glory drafted Jackson with the first pick of the 28th round, but he did not see playing time on the final roster. Ray studied Criminology at Ohio State and enjoyed the life of a private investigator. Ironically it took a tip from a fellow fan (Deadhorse) who gave me the most obvious clue that I should’ve found- to look at the back of RJ’s card. Apparently he had been doing PI work fairly consistently since leaving football behind and had built himself a practice out of Georgia. I sent out a card the following week to his work, but got an RTS. 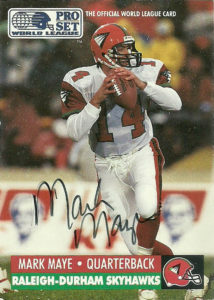 Later Deadhorse came up with a new address for me to take a shot at and I was able to cross another member of the WLAF off my list.